The last high priest; according to the reckoning of Josephus, the eighty-third since Aaron. He was a wholly unworthy person who was not of high-priestly lineage and who did not even know what the high priest's office was, but was chosen by lot, and in 67-68 was dragged by the revolutionary party against his will from his village Aphthia, where he was a farmer, to Jerusalem, to take the place of the deposed Matthias ben Theophilus. He was clothed in the high-priestly garments and instructed as to what he had to do on every occasion. He was an object of ridicule for the evil minded, but this godlessness drew tears from the eyes of the worthy priests. He met his death probably in the general catastrophe. His name is written in various ways by Josephus ("B. J." iv. 3, § 8, ed. Niese). 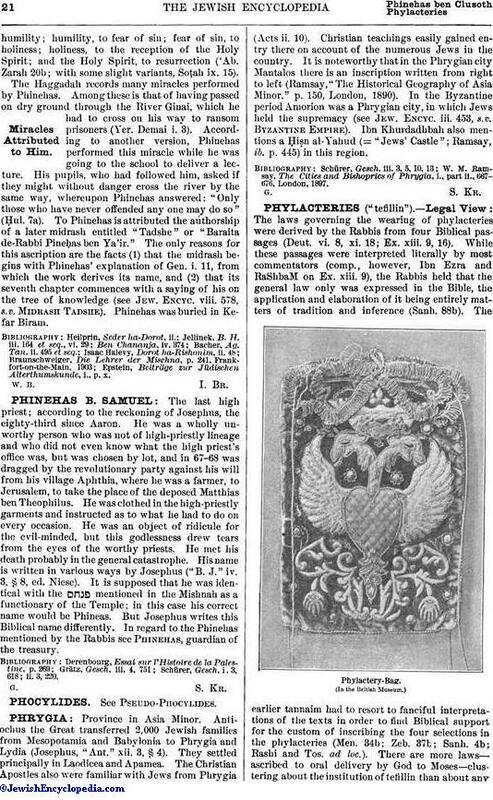 It is supposed that he was identical with the mentioned in the Mishnah as a functionary of the Temple; in this case his correct name would be Phineas. But Josephus writes this Biblical name differently. In regard to the Phinehas mentioned by the Rabbis see Phinehas, guardian of the treasury.